Rabbit redux — As was reported here a couple of weeks ago, there are more jackrabbits in the fields around Mitchell cabin this summer than in past years. I quoted one neighbor who pointed out there are fewer foxes this summer and suspected that might explain the increase in rabbits. However, a few foxes remain, and other predators, such as coyotes, are also around. Not a housecat — Still another predator, which shows up from time to time, is a bobcat. I spotted one last week in the field below Mitchell cabin. From a distance, a person might mistake a bobcat for a large housecoat since they’re roughly similar in general appearance. There is, however, a key difference that allows us to quickly tell them apart; bobcats don’t wear pet collars. A Turkish convoy — No doubt a bobcat would also enjoy a turkey dinner if it could get one. This flock of wild turkeys has been showing up in my fields for months. The turkeys are not native to West Marin. For the benefit of hunters, state Fish and Game biologists in 1988 released a small flock on Loma Alta Ridge just north of Woodacre. The flock quickly grew, and before long wild turkeys were gobbling throughout West Marin. Some birds spread as far north as Tomales, where they were known to chase school children. In fact, the turkeys’ most-impressive bit of mischief also occurred in Tomales. Here’s what happened back in February 2005. 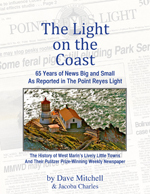 A turkey gliding down off a hill on the west side of the main street (Highway 1) clipped a 12,000-volt power line, causing a “loud explosion and bright flash of light,” residents Walter Earle and Margaret Graham told Point Reyes Light reporter Peter Jamison at the time. The couple said the turkey, which was not set on fire, landed on Highway 1 and in a daze walked around in circles before ambling off across a field and disappearing into the brush. Earle immediately called the Tomales firehouse and reported, “Some turkey just took out the power lines.” Fire Capt. Tom Nunes later said he thought Earle was talking about a drunk driver, not a bird. As it turned out, the turkey had sparked a four-hour blackout in town. Hiding in the grass — Among the most common wildlife around Mitchell cabin are blacktail deer. Their fawns are typically born in early summer, and as of this week, still had their spots. The spots provide excellent camouflage from predators, as can be seen here. Raccoonoitering — Raccoons show up around Mitchell cabin virtually every evening. Raccoon kits are born in the spring and raised by their mothers until late fall. No doubt the biggest killer of raccoons around here is the motor vehicle, but once they’re in my fields, the main threat they face is each other. Unrelated raccoons frequently fight among themselves. We’ve seen raccoons that had lost part of an ear — or even a foot — in these skirmishes. Chinook, like the salmon — An unfamiliar animal I encountered in the past week was this parrot named Chinook (seen perched on my wrist inside Sausalito’s No Name bar). Chinook wasn’t at all skittish around people although all the noise eventually irritated the 25-year-old bird and it nipped my finger — but not hard enough to draw blood. More wild life — The Michael Aragon Quartet performs at the No Name every Friday night. The band plays jazz in the genre of John Coltrane and Cannonball Adderly, and they do it so well that drummer Aragon, the bandleader, has had the Friday gig for more than 30 years. On a couple of Fridays recently Nicasio-based Miwanza Furaha (above) sat in for a few songs. She’s a dynamic blues singer, whose passionate style reminds me of an intense Billie Holliday, and every time she sang, the crowd went wild. Enjoy this photo of you, Dave! You look great. When I was in the Bay Area we had lots of wild turkeys parading up and down the street around our apartment in El Cerrito. Of course, they probably weren’t very wild at that point. It’s funny to watch them charge at cars. The East Bay Express, I think it was, did a big spread about them being a menace and so forth. Your story about the wild turkey causing a power outage is classic! Miwanza is a special talent we have the privilege to make music with! Friday night at the No Name Bar featuring the Michael Aragon Quartet is full of surprises! Hit by 12,000 volts and not fried up into Turkey McNuggets? That is one tough turkey. Remind me to be more polite to these non-native birds next time I visit. Sparsely Sage and Timely is powered by	WordPress 4.9.10 and delivered to you in 0.615 seconds using 56 queries.